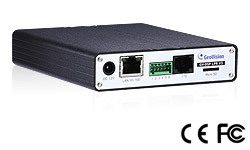 The GV-DSP LPR is a Linux-based license plate recognition system built in a small box. 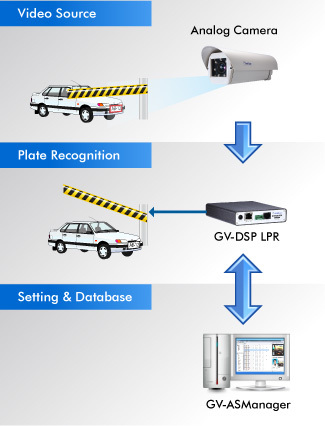 Integrating with a Web server, the GV-DSP LPR can host its own Web site and compare captured license plates either with a standalone database created on GV-DSP LPR, or a database downloaded from the access control software GV-ASManager. When there is a match, GV-DSP LPR will open a gate or barrier. The GV-DSP LPR can also deliver live view images and recognized plate numbers, date and time to the GV-System for security surveillance. 1. The Wiegand interface is NOT functional. 2. The GV-DSP-LPR V3 (firmware V1.05 or later) does not support UAE engine. 3. The relay output can only drive a maximum load of DC 5V, 5 mA. Working in conjunction with the GV-Relay V2 module, it can drive a heavier load of up to AC 250V 10A, DC 100V 5A. 4. Specifications are subject to change without notice. GV-GPS Receiver GV-GPS Receiver is a Global Position System receiver, allowing you to perform vehicle tracking and location verification functions. GV-Relay V2 Working with this module, GV-DSP LPR can drive the loads of relay outputs over 5 volts.